This Saturday, we will be doing our first club party in quite some time… And we will be doing it at Air, out first time at the club. Our special guest for the night is Silent Servant, who will be playing live and DJing. 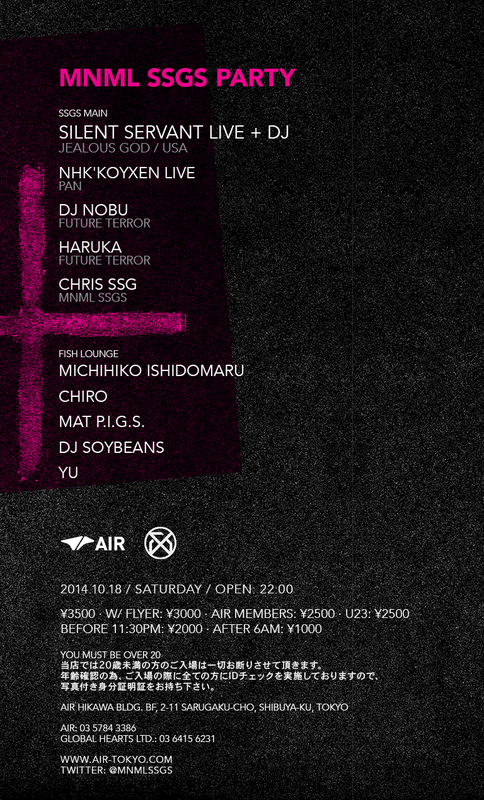 Also joining him will be NHK’Koyxen from Berlin, and Future Terror boys DJ Nobu and Haruka. I’ll be rounding out the mainfloor, and then in the lounge the FISH crew will be taking over. Timetable below. Lounge opens at 10pm, mainfloor from 11pm. Make sure to come join us, this one is going to be well proper.